Regardless of the size or type of organisation, Enabling Solutions can help eliminate substandard and incompatible software purchases, reduce overall IT expenditure, massively improve efficiency and drive-up profitability. Follow the links below for further information on how Enabling Solutions and NetSuite can help you effect a revolution in your operational processes. Enabling Solutions provides complete 360° support for businesses, charities and social enterprises. Working with NetSuite and NetSuite.org, we will provide you with the latest, future-proof cloud solution. We will help navigate your organisation through the transition process, including support with software donations and outside commercial input. Software consultants typically use jargon and buzzwords to sell products and services. Enabling Solutions avoids unnecessary complication, allowing you to fully understand and control the transformation process. 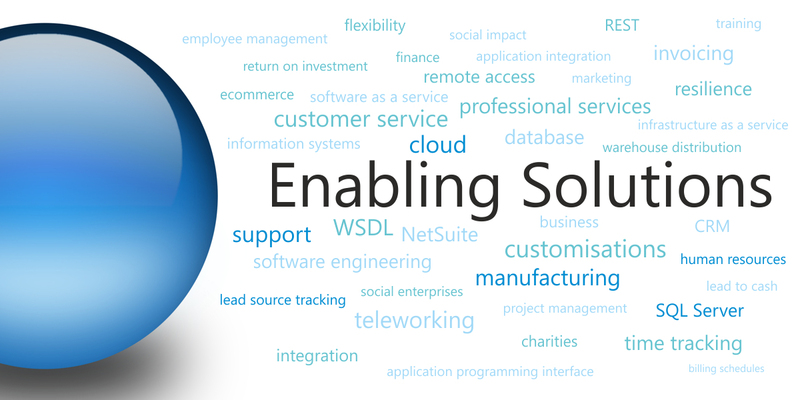 Enabling Solutions appreciates how an organisation can require intensive support in the period following its NetSuite implementation. Our dedicated Training Team will be on hand to supply you with the skills and knowledge you require to maximise the potential of your new system, while our tailored training options ensure effective NetSuite use from day one. Training can be delivered on-site, remotely or at a location of your choice. Our NetSuite Professional Services Team will build bespoke Tune-Up sessions for your company to ensure that your NetSuite implementation is achieving its full potential. All work is geared toward providing your business with the optimal customisation, training and reporting. Where applicable, all Enabling Solutions NetSuite Tune-Ups are supplemented by a full Social Returns on Investment (SROI) report, proof that your organisation is working at its peak effectiveness. Enabling Solutions' developers have experience of every kind of implementation, ranging from small startups to global multinationals. We understand the particular challenges facing all types of organisation and can deliver a solution precisely engineered toward meeting them. Using the NetSuite Business Operating System (NS BOS), Enabling Solutions' experienced developers employ NetSuite's Software as a Service (SaaS) application development platform to build, integrate and deliver vertical applications. Enabling Solutions provides full architectural design and support to solve your organisation’s most complex technical challenges. We can perform full customisation of your NetSuite implementation or integrate NetSuite with any existing systems. If you are a NetSuite solution provider looking to supplement your existing resource base, Enabling Solutions could be the answer you're looking for. We can provide remote support for your EMEA region customers and flexible availability to ensure continuity of service for your NetSuite customers.